Happy Monday, friends! 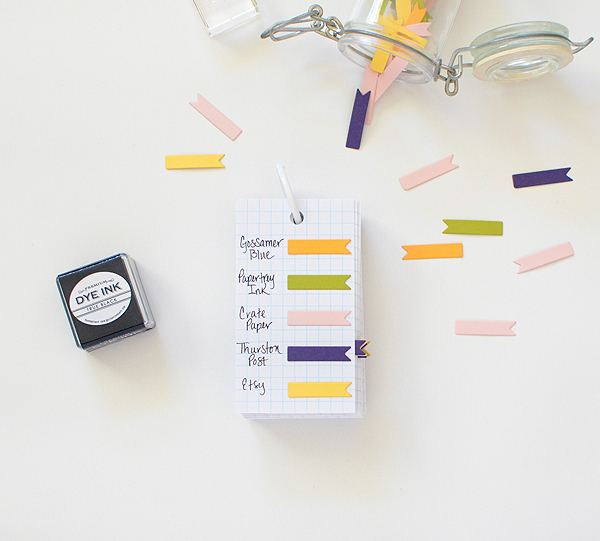 I'm taking you on a trip through my organizational blogging prep which I'm hoping to turn into a habit, thanks to some fun goodies from Papertrey Ink's Moments Inked planning system. I recently took a brief hiatus from social media, but in doing so, fell way behind in sharing the projects I'd continued to create. The amount of work, from the photography to writing blog content to even knowing where to begin, was overwhelming. 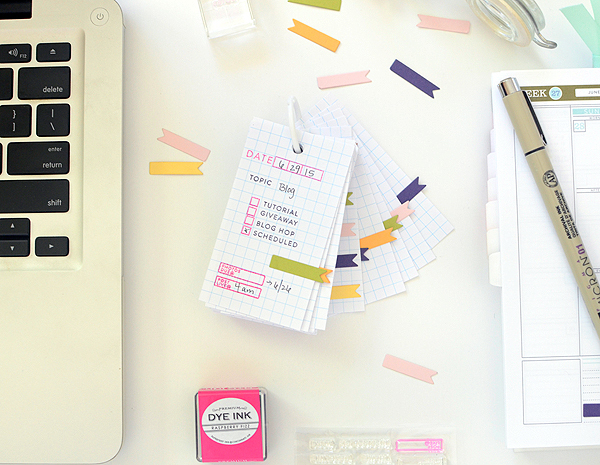 I needed a way to catch up and be organized about it, which is how the very helpful Blog Banners stamp set is saving my sanity. 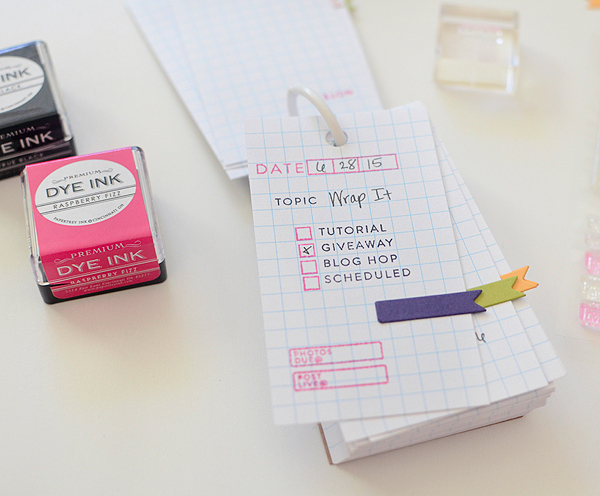 In my post today, I'll show you how I'm utilizing it and a few other Moments Inked necessities to get back on track. After a few failed attempts at creating a simple list, I came up with this solution...It's just a little 2" x 3.5" grid card, but it's helping me out in a very big way. I began with a pack of Word Cards. I buy them at a local Japanese discount store--$1.50 for 160. I did not make my own because I wanted to keep the system as quick and simple as possible--the more effort it took, the less likely I'll be to continue it. So the pre-made stack of cards, complete with punched hole and plastic ring, is what I'll be using. 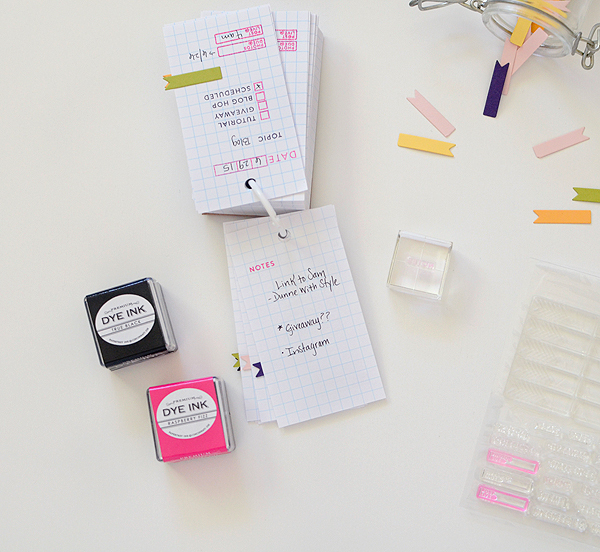 Then it was assembly-line time for stamping. This was the most time-consuming part of the project; I made roughly 100 cards in about 45 minutes. But that's 100 blog posts and they will last me quite awhile! I created the layout that worked best with what I generally include in my blog entries. 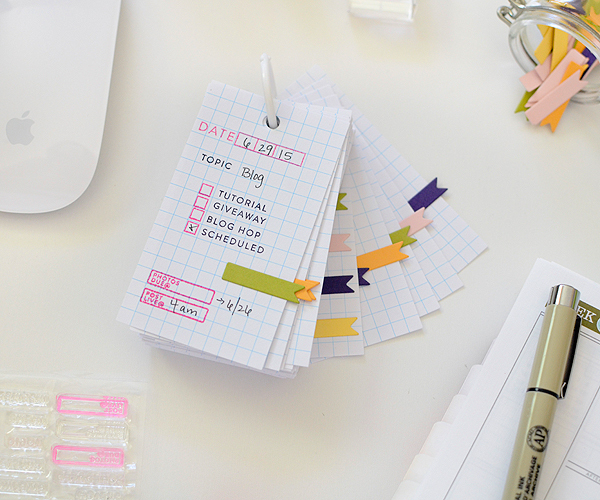 The date, topic, a few extras, and due dates, which are especially important when I'm doing design team assignments. I used the date and small box stamp from the Listed stamp set and I can fill in the details and check the appropriate box when needed. The next thing I did was come up with a simple color-coordination system with card stock and the Planner Banners Die (I swear this is the die I use more than any other one I own!). I have about 5 categories I generally write about and by adhering the corresponding color banner to the blog note, I can easily tell what's lined up when I'm flipping through the stack. It's at the front of my list for easy reference, and I taped one inside my planner, also. The post I did yesterday wasn't for a design team, but was about a fun collaboration I worked on, which falls under the 'Thurston Post' category--so it gets a pretty Royal Velvet banner. On the back of each card, I stamped 'NOTES' in Raspberry Fizz and I can add any important reminders, key words, or other dates, so I don't forget them when it comes time to post. This is also where I'll make notes on the photography end because I have a few projects waiting to be shot and/or edited and this is a great way to keep track of that. 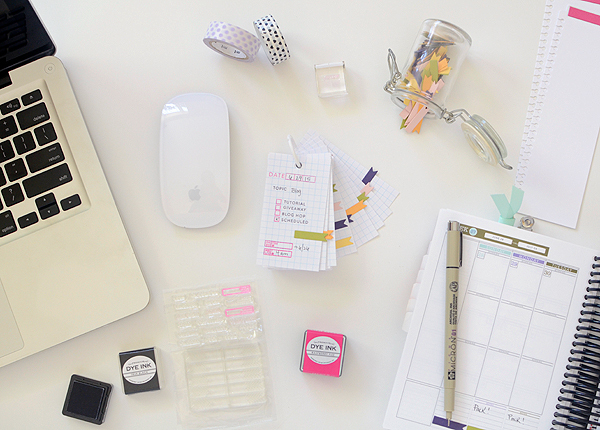 It's going to take some time--a few weeks even--to get caught up with blogging. This system will help me stay on track and keep me from falling way behind again, or getting overwhelmed with what to post when since there will still be new work coming in, too. It's separate from my planner because it could completely overtake my planner like a weed if I let it, but I've streamlined it into my book so that I'm prepared for that week's posts. And when changes inevitably come about--because they already have--I can just toss the little card and create a new one. 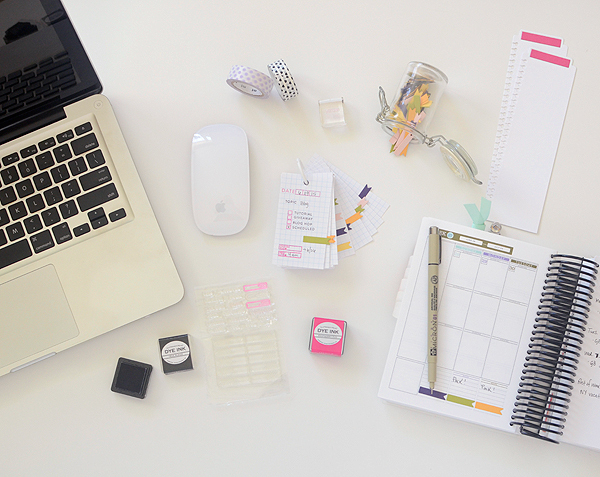 I hope you've found this helpful--if you aren't a blogger, a little system like this might work just as well for meal planning...perhaps that's the next thing I'll tackle! 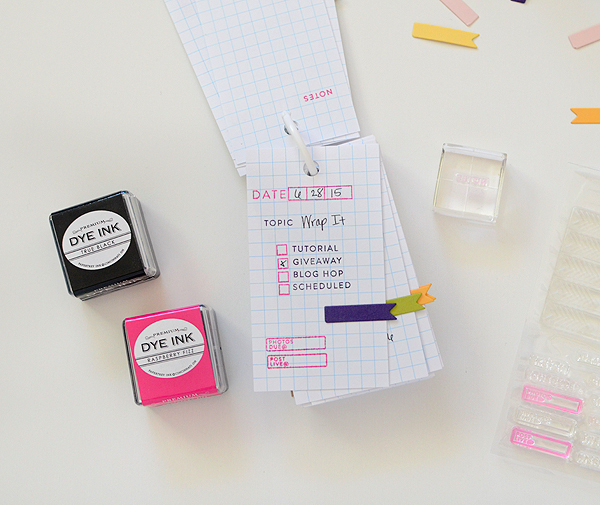 All supplies from Papertrey Ink unless otherwise noted. I really like the way you have customized the system for your specific needs. 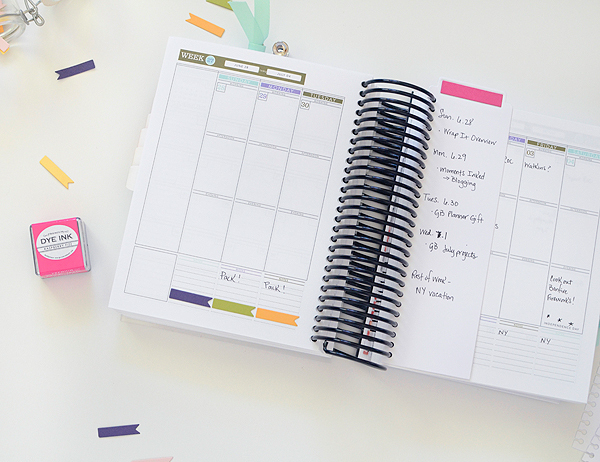 As soon as my PTI planner came in, I was overwhelmed by it's bulk and opportunities to get bogged down...which I did. I'm encouraged to start afresh with my real needs in mind. Thanks! I really actually love this. I have a list thing and I always have to sort it out as to which is due again (creating another list for a list lol). I can't wait until I can start buying up these dies and stamps. They really are a must have!